Cadbury is releasing a limited number of Creme Eggs made with white chocolate and offering cash prizes to those that find them in a Willy Wonka-esque competition. The eggs will be packaged in the standard Creme Egg wrapping and stacked with ordinary Creme Eggs. Mondelez has not said how many white eggs will be made available, but The Sun reports the number to be around 371. Anyone finding an egg will win a cash prize of up to £1,000. They are on sale now and up to Easter Sunday, which in 2018 is on April 1. 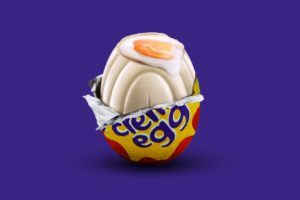 Cadbury has released a new ad to mark the start of “Creme Egg hunting season”, once again starring Creme Egg super fan, Gregg, who made his debut in an ad in 2017 created by Elvis. Cadbury was involved in a spat with Christians last Easter, over the name of its “Cadbury egg hunt”. After the Archbishop of York said that leaving the word Easter out of the name was like “spitting on the grave” of the brand’s Christian founder, John Cadbury, Prime Minister Theresa May waded in, calling the decision “absolutely ridiculous”. But John Cadbury’s great-great-great-great-granddaughter, Esther McConnell, pointed out that as a Quaker, he didn’t celebrate Easter – while the brand defended itself by pointing out that Easter was referred to in much of its packaging and marketing.